Children and adults alike, stood huddled to keep warm with their heads and faces tilted upwards, rosy cheeked and wide-eyed in excitement as well as anticipation of where the next bang will be. I love a good firework display – it’s the whole ritual of wrapping up warm, parking a mile away from the event as it’s so busy, getting there in good time to catch the bonfire being lit and the Guy going up in flames. Then it’s the countdown to the big event itself. I particularly love this time of year, probably because it starts to get cold and I love coming home to a warm house having been out and about, and thawing with a mug of tea in my hands – or better still, soup! It’s definitely soup season, with the shops full of vegetables in every colour and size. Obviously, lots of pumpkins too, but it really annoys me that people waste so much of this delicious vegetable just for the sake of using them for decoration. Preheat your oven to 200C/Gas mark 6 and find the biggest tray you have – that obviously fits into your oven! Wash and chop all the vegetables to roughly the same size and place on the tray. Sprinkle with salt and sugar – around 1-2 teaspoons each and a drizzle of oil, mix thoroughly using your hands and spread out until even on your tray. Roast in the oven for around 30-45 minutes, check on the vegetables after 20 minutes and give them a good stir – with a spoon this time and not your hands! The vegetables are ready when they’re soft and slightly charred – check the carrots as they normally take the longest. You can eat the vegetables as they are with a piece of fish or chicken, but to turn them into soup, simply scrape all the vegetables and their juices into a large saucepan and cover with boiling water and ½ a stock cube. Bring to the boil then whizz with a hand blender or in a food processor until smooth. 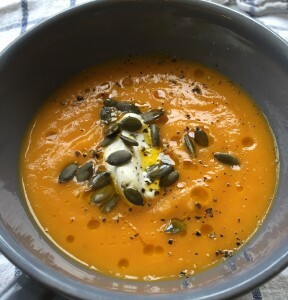 If you’re going to eat immediately, serve with a blob of yogurt, a couple of pumpkin seeds, a grind of black pepper and a drizzle of chilli oil. Cooking Tip: Pumpkin freezes really well, just leave to cool and portion up into plastic boxes.